Tariff change problems with Post and Go stamps reported. The BPMA had problems over the past few day, so new varities, the same but less so. 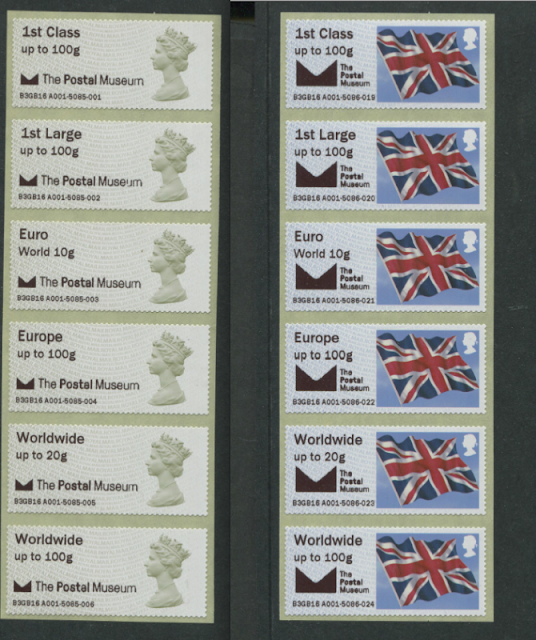 Problems with Mail Centre / Delivery machines + all museums having a new stamp Euro (blank no weight) Worldwide 10g. I do not think many people would have noticed or gone to any machines when they would be paying what would be 7p more each strip. If you have news for us, please send an email to the address at top right, rather than add to other posts which are not directly relevant. And if anybody has pictures or more details of this from the new Postal Museum, or any other locations, please let me know! I am pleased to say that I have now been sent some images and part of the story of these. Apparently on Tuesday 29 March (the first day of the new rate), the BPMA machine was unable to process card payments (it may have worked for about 20 minutes). It was fixed and working properly by late afternoon on Wednesday 30th. These examples were obtained on the morning of Thursday 31st. The single stamp is from machine M002 at Mount Pleasant and examples are known from at least two other locations. It is likely that all Museum and Enquiry Office machines were affected, although the faulty stamps may not have been bought from all of them. This error also occurred last week but seems to have been corrected quite quickly. The pictorial (Flag and Heritage Transport) stamps have both single line and 3 line captions. The Machins have two single line captions superimposed. Only one logo appears on any of them. The errant caption is smaller and is the same on all stamps. I've selected single stamps from Collectors Strips, but all stamps in the strip showed the same error.